The grading done by using the layers of dielectrics having different permittivities between the core and the sheath is called capacitance grading. In intersheath grading, the permittivity of dielectric is same everywhere and the dielectric is said to be homogeneous. But in case of capacitance grading, a composite dielectric is used. This is shown in the Fig. 1. The stress is maximum at surface of conductor i.e. x =d/2. And the stress is maximum at inner surface of dielectric i.e. at x = d1/2. Key Point : Thus the electric stress is inversely proportional to the permittivities and the inner radii of the dielectrics. 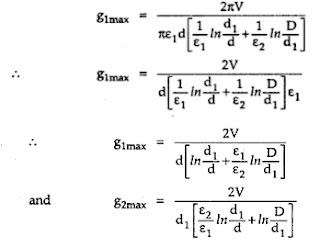 Let us obtain the condition under which the maximum values of the stresses in the two regions are equal. Now d1 is greater than d so to satisfy above equation ε2 must be less than ε1. Thus the dielectric nearest to the conductor must have the highest permittivity.